Fierce Octopus. Final artwork submitted to Eight Arms of Inspiration. I’d never drawn – never even thought about drawing – an octopus until a friend asked me to create something for an e-book she was getting ready to publish. I had no idea how to begin – should I try for something realistic or go very stylized? So I spent a lot of time looking at photos of these intelligent, beautiful creatures and making a lot of sketches. After a few go-rounds, my friend selected the octopus that seemed right and I completed the remainder of the cover artwork and I put away octopus thoughts and sketches. Watercolor sketch in black and red. Final artwork submitted to Eight Arms of Inspiration. 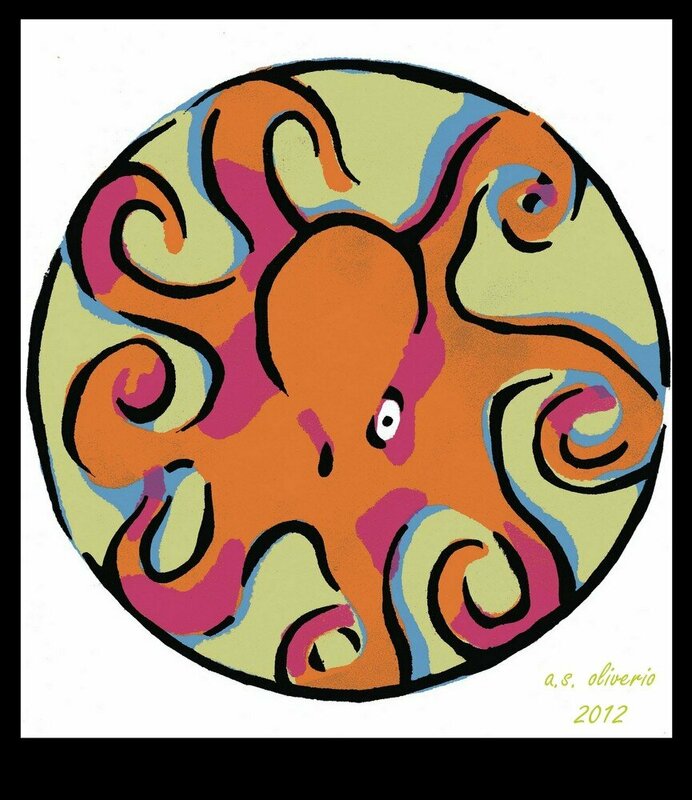 Eight Arms of Inspiration: The Octopus Art Project is a collaborative octopus art book project that seeks to honor outstanding artists and their work, while supporting arts education and keeping creativity alive in schools. The idea of the project rose from my lifelong adoration and intrigue with the almighty octopus. As a writer, editor, and longtime cephalopod admirer (who also wears a large realistic octopus tattoo on my neck and chest area) it was inevitable that my love for collective art, octopi, and book projects would eventually collide. For the past four years I have worked on some wonderful book projects for Memento Publishing as an editor and writer, where we create art and tattoo-related publications. One of our books, Cranial Visions, was a mixed medium collection featuring various artistic interpretations of the skull. I loved that this publication featured artists of many different mediums and I wanted to bring a talented group of creative souls together in a similar way where they were all focused on one subject. Because of my fondness for cephalopods and the incredibly diverse ways that there are to bring their beauty to life, I decided that focusing on the octopus would be a great way to bring all of these artistic talents together and honor this beautiful eight-armed creature with three hearts, no bones, and blue blood, known as the octopus. Another important element to the project was to give back to the artistic community and help to inspire young artists to follow their creative aspirations and keep their imaginations growing and flourishing. So an added incentive for getting involved in the Eight Arms Project is that 10% of the profits from book sales will go towards arts education through an incredible charitable organization called donorschoose.org that connects donors to classrooms in need. The response to this idea has truly been overwhelming. The incredible array of submissions that have rolled in so far are awe-inspiring and I am consistently blown away each day when I go to my inbox and see the artistic beauty that is before me. The artists involved are not only talented and ingenious, but their love for this subject matter and passion for the project has been inspiring to the say the least. We are looking at a fall release date for the book and there will be updates and information available on the Eight Arms of Inspiration website (www.EightArmsProject.com) and the Facebook page (https://www.facebook.com/EightArmsProject) throughout the process. After the submission deadline, we still plan to upload octopus artwork to the site and keep the octo-love flowing; so the book will not be the end of this project and we hope that everyone will continue to create and come together as a creative force! They’re great. I wish I had some artistic talent. Poor kids can only ever get me to draw stick people. I love the final and the blue and purple. You simplified the figure very well and it reads very clearly. Love this, it’s the kind of design I want on a T-shirt. Also octopi are great, extremely intelligent and apparently quite sociable. 🙂 Thank you! Honored to be a part of it! I LOVE it!! What an amazing creative soul you are!! This is such a fantastic project – good luck with it!! and thanks for sharing. Oh, thank you, Anne! It’s been so much fun. I’m wearing my “Blue Octopus” t-shirt today, too. How cool is that?! Thank you, my friend! They’re inspiring indeed! I love all of them, from the sketches down to the final product. You are such an artist of many forms, keep it up! I really appreciate your comments – thank you so much! Ohmigosh. The octopus is one of my favorite things in the world. Sooo fantastic!! I love them… your final submission, and of course the watercolour which is my favourite medium to work with (though I haven’t painted in quite a while). I don’t do enough in watercolor anymore – have lost some skill there, so it was fun working with them again. Why haven’t you painted in a while? A whole bunch of things that sort of ambushed me and it took me a while to recover 🙂 and I’m quite the temperamental sort 😉 I did move on to working with clay for a while and made my little clay boys that are also featured on the blog. I go in and out of the artistic thing. Right now I’m not working much on painting, but – it’s okay. Just a cycle. Creativity happens in all kinds of ways! What an inspiring cause 😀 – This is utterly fabulous! Your watercolour sketch is stunning! These are beautiful – but my favourite is the watercolour. You sure captured that cephalopod magic! (Big grins) Thank you! Glad to have been a part of the project and to get creative! We have a beautiful octopus painting we bought at a local event last year. I’ll have to post it somewhere for you to see. Yours are gorgeous! I love the sketch and the two below it. I’m so jealous of your artistic talent! I’d love to see it! Thank you!